The Triple Crown series demands a thoughtful plan. building strength and stamina. Let’s apply those newly developed attributes in the best way possible. Many times the climber with the smart plan will outscore his less thoughtful opponent. Here’s how to make the best of your comp days. You can be faced with two quite different scenarios: In the first you’re competing in a boulder field where you have some experience such a Triple Crown event you’ve previously participated in. The second setting is an outdoor event where you’ve never been or an ABS or similar indoor comp where all the problems are new. In either case you need at least a basic competition plan. Comps like the Triple Crown give repeat participants a distinct advantage. Given that you’ve previously explored the boulder field you can create a custom tailored plan for your day in which you can maximize your score. Just make sure you ease into your day as described in Tactic 2. In the latter case, at a minimum decide the difficulty and type of problem best suited to you. For an outdoor event you can consult with others who’ve been to the site that can give you insight into problems to try and those to avoid. They may even be able to help you choose an entire circuit to pursue. For ABS try to stick with the degree of overhang and type of climbing at which you excel. Too many competitors jump right in on a difficult grade, and if they don’t immediately send they will often spend an inordinate amount of time and effort completing that early problem. Don’t let it be you! 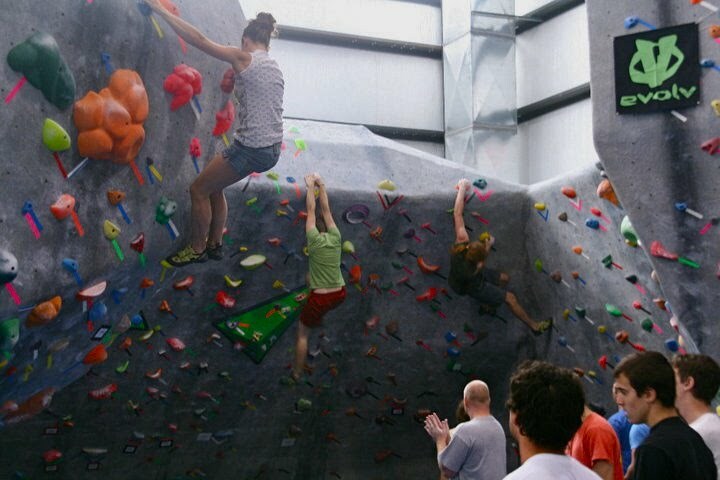 Get a few warm ups in at grades significantly below your max, and even if you’re a solid boulderer do a couple V0 or V1s to alleviate the pre-comp jitters everyone feels. And don’t forget to get those scores, no matter how paltry they may seem, down on your card. Getting in a few early sends will calm you down, get the blood flowing to your forearms and loosen up the tendons. After your warm up don’t get anxious and begin throwing yourself at hard problems. Start slow and ease your way up through the grades. Begin three below your max and do one problem three grades below and another at two grades below; for example, if your max is V5, do a V2 and a V3. This accomplishes several things: 1. it completes your warm up by increasing the climbing intensity toward your high scoring problems, 2. it builds confidence and success, and 3. you now have four or five scores on your card. Many competitors will end the day without a full complement of scores. ABS typically scores your best five and Triple Crown your best 10, and it’s truly astounding how many competitors will turn in a card with fewer sends. A V2 may not score as high as another V5, but it’s better than a goose egg. Starting slow means you’ll already have four or five scores when your competitors are struggling to get their first. As you move to more difficult problems, don’t try to on-sight. Watch and talk to others to discover critical beta and to assess whether or not you want to attempt this particular problem. You will typically not receive any more points for an on-sight than for a flash or redpoint so wait, watch and learn. Indoor bouldering comps reward planning too! of the event is almost always a factor in your score. Conserve your precious energy by minimizing your attempts at higher scoring problems – have a set of problems in your plan that you can send first try. If you’re competing at an ABS comp where the routes are all new, watch other climbers of known ability try a given problem to see if it’s a good fit for you. Triple Crown is an all day affair and an ABS comp can be several hours long. It’s easy to ignore your basic nutritional needs in the rush to get things done, but set aside time to eat small portions here and there and drink plenty of fluid. Mild dehydration and a lack of fuel can rob you of critical energy just when you need it later in the day. At some comps you’re required to add up your own score. Take your time. Make sure you have the requisite signatures from judges or competitors and that your score adds correctly. Double check and then turn it in and relax, you did the best you could! A thoughtful plan can mean the difference between a successful and a disappointing day. Think about what you can reasonable accomplish, create a plan, and then follow through. Good luck this fall! This entry was posted on Wednesday, September 28th, 2011 at 10:26 am	and is filed under Competition. You can follow any responses to this entry through the RSS 2.0 feed. You can leave a response, or trackback from your own site. 1. use comfortable shoes for the warm up / moderate problems, save the cripplers for the harder attempts later in the day. You don’t want toe pain to be the limiting factor. 2. If you’re competing on new rough plastic holds indoors, consider taping your tips for the warm up / moderate problems. You don’t want skin to be the limiting factor either.